As the owner of Eric Rogers, LLC, Aimee Anderson is committed to providing the unprecedented service her late husband Eric Rogers built the business on. With experienced crews, advanced equipment and the highest quality materials available, Eric Rogers, LLC continues to honor the hard work and excellence the business was founded on. 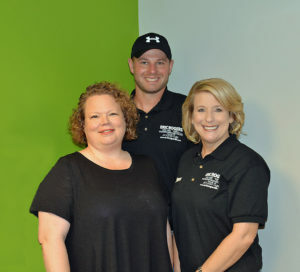 Eventually, as he worked side by side with Aimee and with the crew they established, the company expanded into lawn care and asphalt driveway resurfacing. Since that time, contracts have grown to include Ingham, Eaton, Clinton and Ionia Counties. Today, Eric Rogers, LLC, employs more than 20 experienced individuals and maintains a fleet of trucks, mowers, and equipment to meet a variety of needs. From Howell to Portland and from Charlotte to DeWitt, Eric Rogers, LLC specializes in lawn care, snow removal, asphalt driveway seal coating and everything related. Whether you have a one-time need, want a monthly contract, or require an annual contract that includes maintenance in all seasons, we can meet your needs. Browse our site to learn more about how Eric Rogers, LLC, can work for you!